One of the great fashion designers of all time. And beauty makeup designer, too. Yes, Armani is even brilliant at making women's faces more beautiful. We're taking a look at Giorgio Armani's Beauty Fall 2009 Makeup collection. And we fell in love with this Fall Manta Ray line. "Makeup that becomes like a mask is good in a (fashion) show, but day to day, it must be there, but it must not be visible," he tells Allure magazine. "The makeup has to help the face show its best aspect and cover the negative." And we believe the designer has once again, followed this approach with his Fall Manta Ray collection. Strong, and yet, quite subtle. 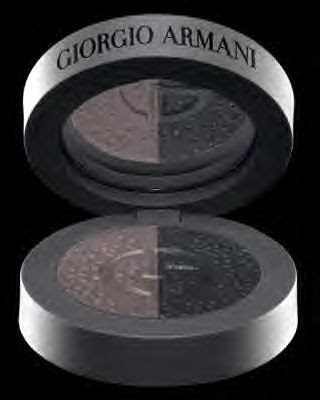 The Manta Ray Eye Duo in Greige and Charcoal ($32) is Armani-inspired "by the precious and luxurious materials used in Giorgio Armani fashion accessories, the palettes offer a beautiful selection of color harmonies inspired by nature. The collection features subtle hues that offer a new take on the timeless color “Greige,” create by Giorgio Armani. The rich filtered eye tones, presented in a matte Greige compact, give depth and mystery to the eyes with subtle contours and highlights." And the Armanisilk Lipstick ($25) comes in 19 gorgeous shades to complement the smoky eye. http://www.giorgioarmanibeauty-usa.com/. And you can buy everything Armani at fine dept. stores like Saks Fifth Avenue and Bloomingdale's. Armani's expensive but reeally good makeup.This line appears to be very sophisicated.I like the 'griege' shadow.very nice!